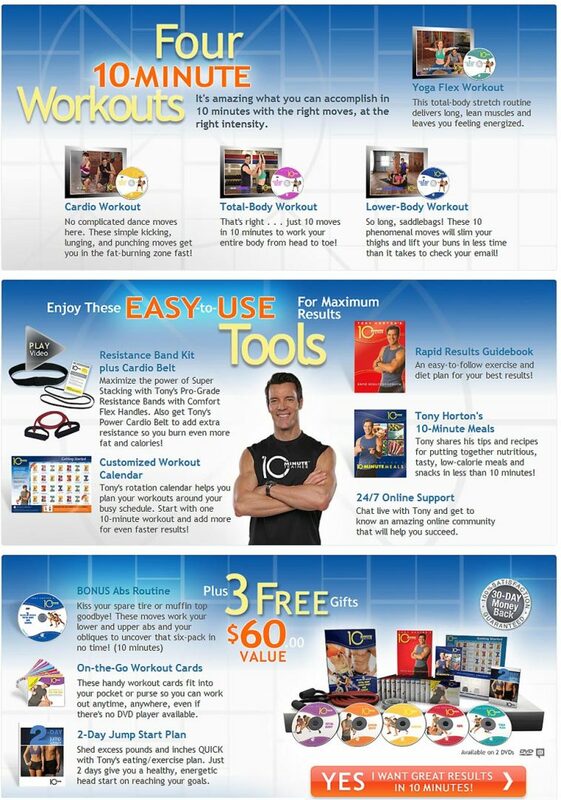 The New 10 Minute Trainer by Tony Horton Delivers Results. Do you want to lose weight, get toned, and feel great but dont have a lot of time? Look no further. This is a breakthrough fitness and workout program that will get you where you want to go with 10 minute workout programs. "I don't have the time" is no longer an excuse. Now you can tone your body, lose weight, feel healthier and get the results you deserve. In todays fast-paced world, we all have time restrictions, family obligations, work commitments and numerous other issues that take our attention away from our workout, fitness and weight loss plans. Thats why this program was designed for short, 10 minute spurts, where you can multitask and work different body parts all at once. In doing this, you will get moving, get results and stay committed. How Can You Do This in Only Ten Minutes ? The answer is 10 Minute Trainers unique way of using a technique called Super Stacking. Super Stacking combines simultaneous moves for different body parts. Super stacking is how 10 Minute Trainer can incorporate non-stop fat burning with strengthening all while shortening the overall time you have to spend working out. It mixes cardio and strength training and decreases the need for countless hours spent working out each individual body part. This is a complete body workout program that is guaranteed to get you the body you dream of and keep you motivated and excited while doing it. This workout will cover 10 moves over 10 minutes. Expect a fun and challenging workout from head to toe! This routine will have you in the fat burning zone fast. With a combination of kicking, punching, and lunges you will get your blood flowing and calories melting. Target those problem lower body areas with Tonys signature moves in just 10 minutes. Slim those thighs and lift that bun in no time. Get ready for a total body stretch exercise intended to deliver lean , flexible muscles and leave you feeling energized. And access to your own personal Coach, online tools, blogs and some extras. These Extras include a 10 day Lean Jeans plan where you get a 10 day eating and exercise plan, tape measure and journal to blast you into your weight-loss and into those skinny jeans in no time. You will also get a special Abs workout DVD and on-the-go flash cards that will help you get your 10 Minutes in anywhere and anytime. Give us 10 Minutes, Get Moving and Get in shape today!